SmitCo LLC has several different diaries with lock and keys and other diary sets in fun themes, Scrapbook sets, several different nail art sets to provide hours of fun, 3 unique princess dress up sets, and jewelry and jewelry sets in: rose gold, gold or rhodium plated, as well as very popular beaded stretch sets for little girls. These are all affordable gifts for girls ages 2 to 12. Great for birthday or Christmas gifts. 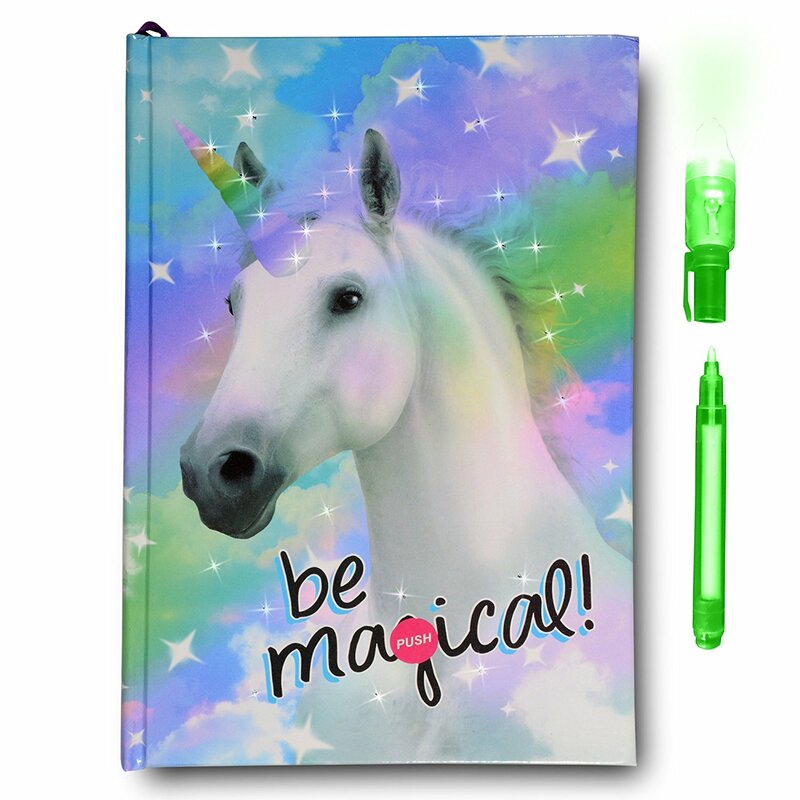 The Light-Up Unicorn Journal has a rainbow colored unicorn on the cover with the words "be magical!". The cover also has small twinkling LED lights that light-up and change color when the front is pressed in a certain spot. This diary comes with a pen that writes in invisible ink so that the messages can be kept secret inside. It also has an attached pink satin ribbon with a sparkly book marker connected to the top so that the page can be saved. The pen also has a switch on it that turns on a blue light on the end to show what was written with the invisible ink. This journal is 8.5 x 5.5 x 1 inch with 80 double sided lined pages. Batteries are included. Takes 3 alkaline batteries in the pen and 1 lithium metal battery in the light up book. Recommended for ages 6 and up. 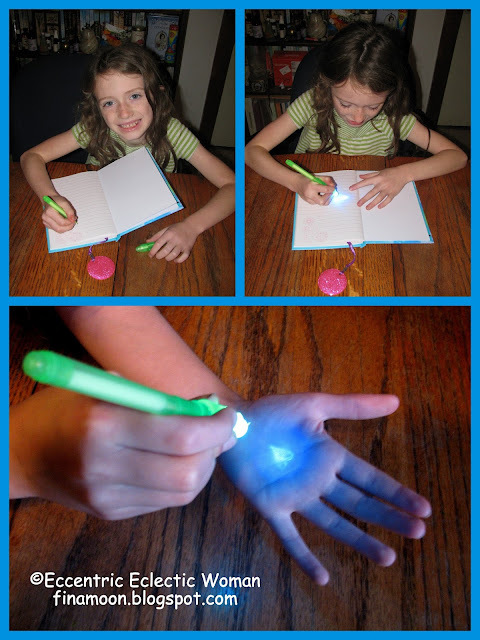 Zari trying out the invisible ink pen. This special journal is not your average everyday diary. It has some really neat features. My daughter Zari really loved the twinkling lights and majestic unicorn on the cover. She also loved that it came with a pen with ink she could write with inside it and others wouldn't see what she wrote because it was invisible unless under a black light or the light of the pen itself. We did find that the pen's light is fairly faint because we could hardly make out what was written with it on the pages. You can use a regular pen, but that kind of defeats the purpose of Also I do want to say that if you take the PUSH sticker off of the product you need to remember where it was so that you can press the correct area so that the lights illuminate and press firmly there to activate. This will keep Zari busy putting her thoughts and doodles down on paper. She can't wait to personalize it and make it her very own. I hope this will be something she looks back to fondly when she is older. 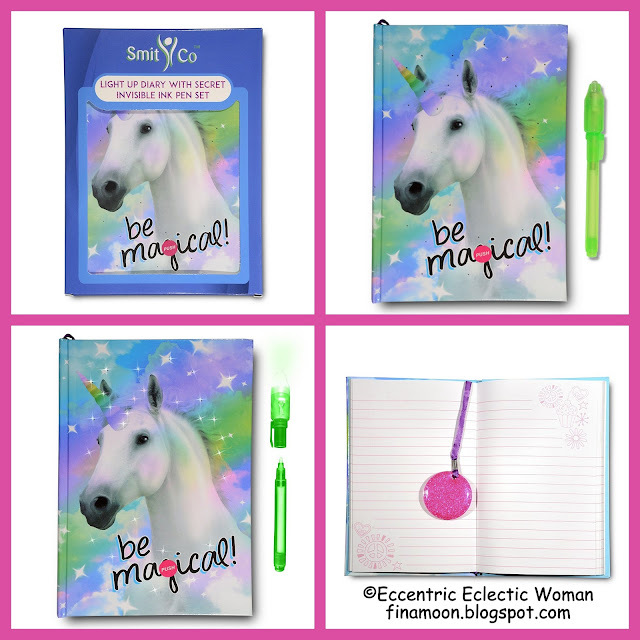 The Light-Up Unicorn Diary is perfect gift for girls ages 6 and up. I highly recommend journaling as an activity to keep ones thoughts, creative expressions, doodling, sketches, stickers, daily events, notes, dreams, secrets, writing, coloring, poems, drawings, devotionals, prayers, etc. This journal is perfect for keeping the written portion of it safe from prying eyes of siblings, friends and even Mom and Dad!